Sage. Oh how I love its silver-gray leaves, its earthy, herbaceous scent and how plentifully it grows in my garden! This spring my herb box overfloweth with sage: large-leaf, small-leaf, purple and variegated. I have them all. 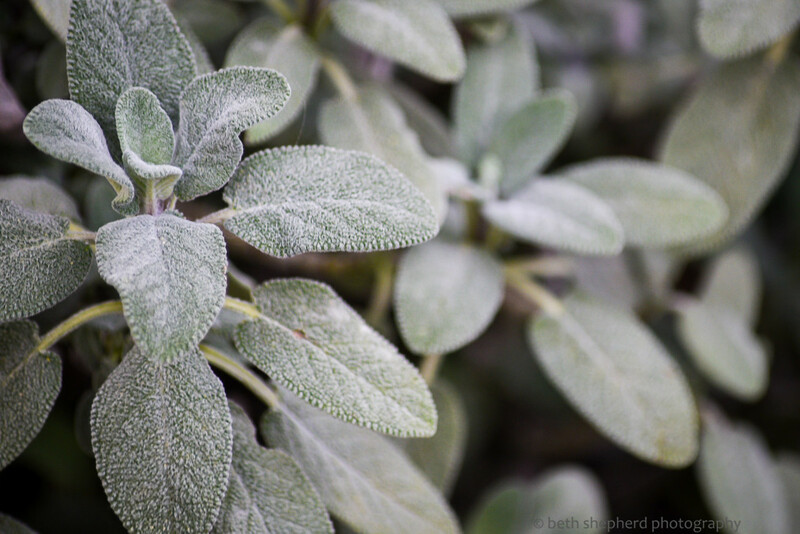 And maybe a bit more of them than I need, which means…it’s time to make Sage Pesto! I make a lot of pesto because the possibilities of what to do with it are endless: stir into risotto, slather over shish-kebab, smear on bruschetta, tuck inside an omelet, mix into salad dressing, garnish a soup. I also make a lot of pesto because I grow a lot of herbs. Sage, thyme, rosemary, oregano, and basil (in summertime) grace my herb boxes. And once you’ve tasted garden-fresh herbs, it’s impossible to go back to using dried. Pesto recipes are plentiful and while they all incorporate many of the same ingredients–olive oil, herbs, garlic, cheese, nuts–there are infinite ways you can mix and match to create your own unique pesto recipe. Change up your nuts. 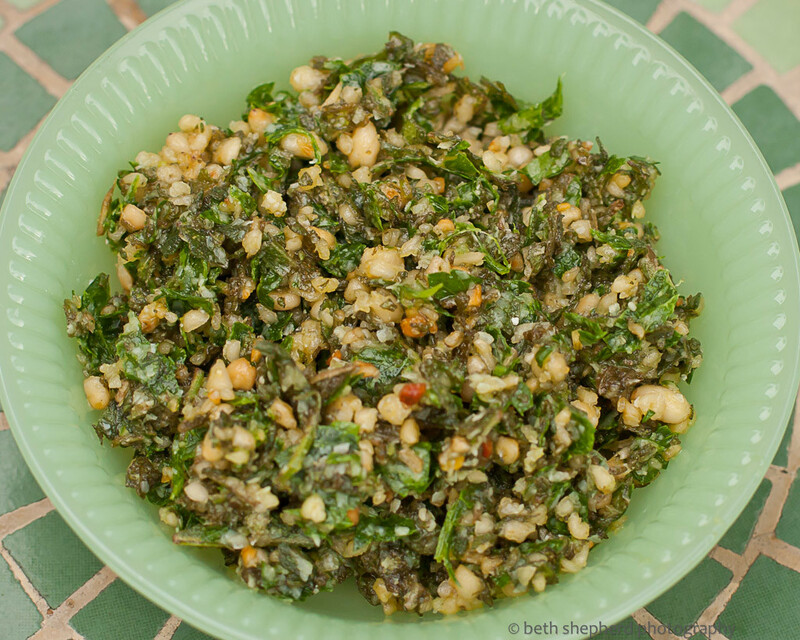 I lean toward pine nuts for most of my pesto recipes but walnuts, almonds or even hazelnuts can be used. Add a touch of mint to brighten things up, a few tablespoons of lemon juice or grated lemon zest. Cheese can be traditional Parmesan (Parmigiano-Reggiano) but you can also try Asiago, Pecorino, Romano or Spanish Manchego. You can also vary the texture of your pesto. Run your ingredients through a blender or food processor and you’ll wind up with creamy pesto, whereas if you chop the ingredients by hand you’ll have a more gritty, rustic pesto. I’ve come to really enjoy pesto made this way. However you make it, pesto is one of the most versatile condiments around! Here’s my recipe for hand-chopped, rustic sage pesto. I like to toast my pine nuts. If you choose to do this, brown them in a dry saute pan, but be careful not to burn them. Next, get out a big wooden cutting board and bit by bit chop the sage, parsley, pine nuts, garlic and Parmigiano-Reggiano. I find the best way to go about this is start with a half-cup of combined dry ingredients, adding more until all the dry ingredients have been coarsely chopped. You can chop your ingredients with a knife or, better yet, try a mezzaluna, is a single or double curved blade with a handle on each end. A half-moon shaped pizza cutter also works nicely. After everything is coarsely chopped, drizzle in the olive oil, stirring to combine. If you’re not up for hand-chopping–though you really should try it–combine the sage, parsley, pine nuts and garlic in the bowl food processor or blender and process to the consistency you prefer. Then, with the motor running, drizzle in the olive oil, adding more olive oil for a creamier consistency. Thoroughly mix in the Parmigiano-Reggiano. Add salt to taste if desired. Note: You can store your pesto in the refrigerator for up to a week or freeze it–a lovely thing to defrost in the middle of winter when some herbs are sparse. Anoush Abour means “sweet soup” in Armenian. This dish has graced New Year’s and Christmas tables in Armenia for centuries and most likely predates Christmas itself. But wait, you say. Christmas was last week, December 25. 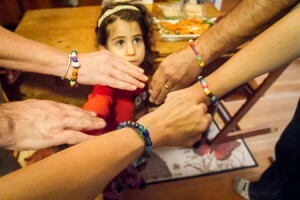 Not so if you are Armenian. December 31 kicks off the holiday festivities with Father Christmas visiting on New Year’s Eve and Christmas itself taking place on January 6. Almost all the recipes I saw for Anoush Abour use apricots and golden raisins and almonds were the most frequently mentioned nuts. Sometimes honey was used and other times sugar…or no sweetener at all. Pistachios, pine nuts, walnuts, hazelnuts (filberts) and pecans were all game. Almonds might be slivered or whole and blanched. Pomegranate seeds? Some say yes; others say no. The same goes for rosewater, orange flower water and cinnamon. Many of the Anoush Abour recipes call for “skinless whole wheat” or gorgos or korkot. I’ve been told you can find it in Middle Eastern grocery stores, but I have not looked for it. I have also seen this grain referred to as “pelted wheat or pearled wheat.” From what I’ve gathered, the most likely grains to use for this recipe–broadly available in the U.S.–are white wheat berries or pearled barley. 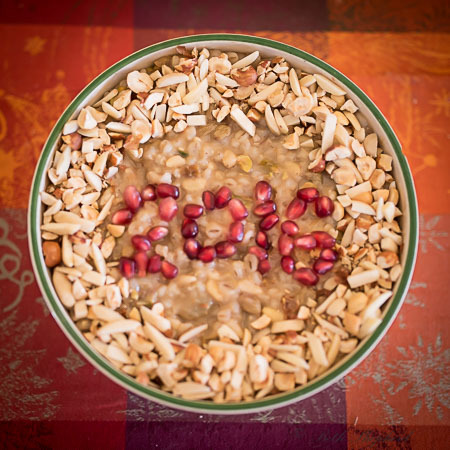 Instructions for how to make Anoush Abour also vary from how to cook the dried fruit to whether the top of the dish should be decorated with nuts in a recognizable pattern. One recipe mentioned setting whole blanched almonds on top, in the shape of a star. 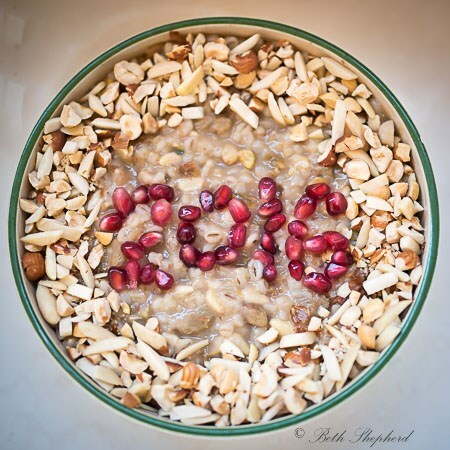 Another said that, traditionally, women would use almonds to write the number of the new year. Note: You can use any combination of nuts you prefer. In a large pot, combine wheat (or barley) and water. Bring to a boil for five minutes, and then cover and simmer on very low heat for an hour. When the hour is up, set the pot aside for 5-6 hours, or overnight for the grains to soften and the “soup” to thicken. Note: Anoush Abour is more like a pudding or porridge than a soup in terms of its consistency. On low heat, in a small saucepan, add dried fruit, honey (or sugar) and one cup water. Stir occasionally until nearly all the water is absorbed. Add pistachios and pine nuts. Simmer for another 10 minutes. Thoroughly drain and cool. 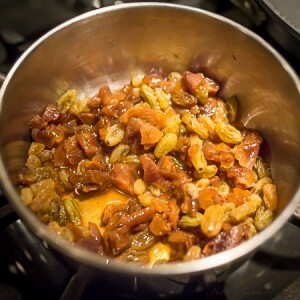 The next morning (or six hours later), mix the sweetened fruit and nuts into the (now room temperature) barley. Cook the combined ingredients over low heat for 10 minutes. Your Anoush Abour should be thick but not dry. Pour into a serving dish or bowl. Garnish with hazelnuts, slivered almonds and pomegranate seeds (You want to garnish when the dish is warm and a bit sticky). Serve slightly warm or cooled to room temperature (and you can store it in the refrigerator for up to one week). My 2016 be filled with sweetness. I count myself lucky. I’ve had many wonderful friendships in my lifetime, but I was especially blessed to have had this one. 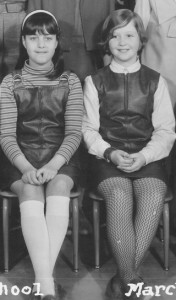 One friend who knew me from the time I was a little girl until the time I was a grown and married woman. Forty-four years of friendship. Neighbors across the street when we were six and college housemates when we were twenty. Housemates and friends. Me and Dee. Living together. Cooking together. I still love to cook and I’m certain the roots of my passion go back to the days when Dee and I scoured the Moosewood Cookbook for recipes. The first edition was published in 1977, the year I graduated from high school. Moosewood was the seminal vegetarian cookbook. 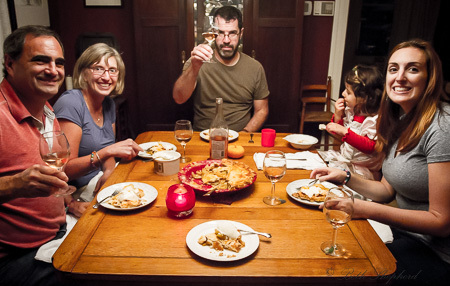 And–lucky us–since Moosewood Restaurant was just down the hill from the house we rented in Ithaca, NY. 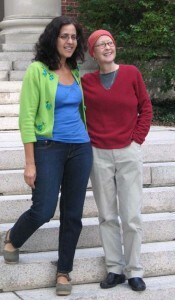 As Cornell University undergraduates, we didn’t dine out very often and, when we did, it was a huge treat. 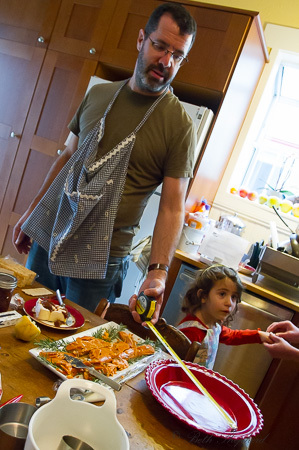 Most of the time we cooked Moosewood recipes in our tiny kitchen on College Avenue. Spanakopita. Vegetable Stroganoff. Cauliflower Cheese Pie with grated Potato Crust. Countless simple, delicious recipes. But the undeniable favorite, our signature dish if you will, was Mushroom Barley Soup. It was the first soup I ever shared with Dee and also the last. She made this soup for Joel and I, when we visited her home outside Boston, a year before she died from breast cancer. On this day, for seven years now, I make this soup and remember her. Life may be short, but the memory of a good friend lives on. Cook barley in 1-1/2 cups of the stock or water in a large saucepan or Dutch oven. Bring to a boil, cover and simmer until barley is tender (20-30 minutes). Add remaining stock or water, tamari and sherry. Meanwhile, melt the butter in a skillet. Add the onions and garlic. Sauté for about 5 minutes over medium heat. Add mushrooms, and salt. Cover and cook, stirring occasionally, until everything is very tender (about 10-12 minutes). Add the sauté with all its liquid to the cooked barley. Add fresh ground black pepper to taste and simmer, partially covered, for another 20 minutes. I’m always on the lookout for new gluten free products since Big Papa can’t eat wheat. When I saw Cappello’s Gluten Free (and dairy, grain and soy free) gnocchi at our local Central Coop, I was pretty excited. 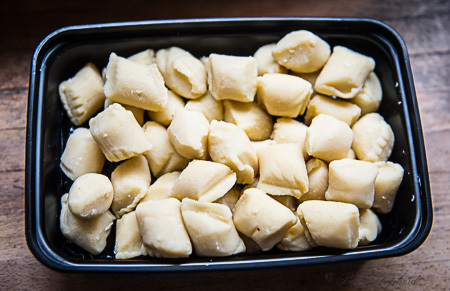 Although gnocchi, soft dough dumplings are typically made with potato as a base, wheat flour is also added. 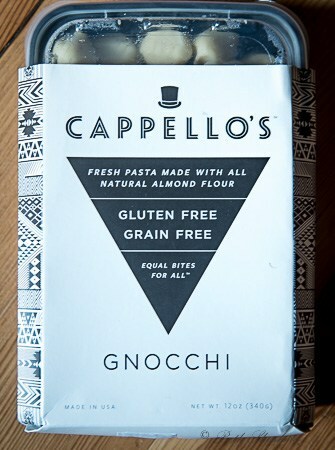 Cappello’s gnocchi uses potato flakes, along with almond flour and tapioca flour so not only is it gluten free, it’s grain free. 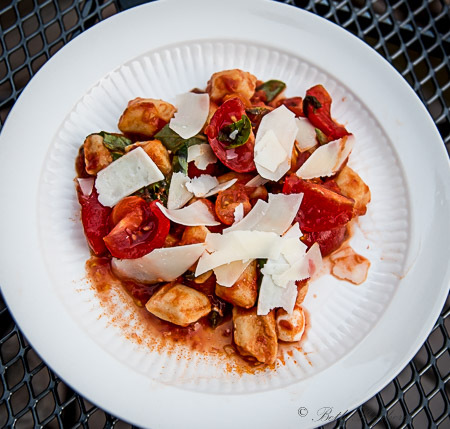 Gnocchi aside, I had a bowl full of garden fresh tomatoes and plenty of fresh basil longing to be featured in a dinner recipe. And, home-grown garlic! Wallingford was my tomato inspector. He thought they looked pretty tasty. 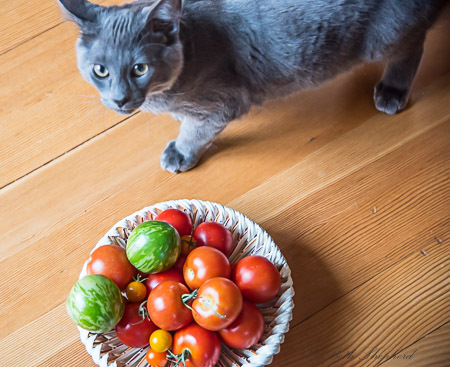 A tomato eating cat? Don’t put it past him. He ate cooked mushrooms last week. Of course the addition of mozzarella cheese balls made this dish irresistible to our feline family member, so Wally had to sit out the rest of dinner prep in the bathroom. 1 cup mozzarella bocconcini (1 inch diameter mozzarella balls) or cilegine (cherry-size balls). 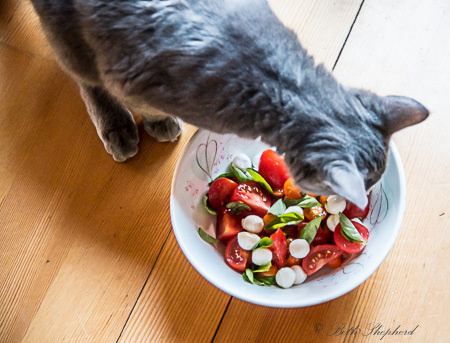 Place the cut tomatoes and mozzarella in a bowl and set aside. Cook the gnocchi according to the package directions. Drain and set aside. Warm 1/2 cup tomato sauce (optional). Heat the oil in a skillet over medium-low heat. Add the garlic and cook until fragrant, about 1 minute. Remove from heat. Add the garlic-infused oil to the pasta and then toss in the tomato mozzarella mixture. Stir in the tomato sauce (if using). Season with salt, black pepper and red pepper flakes. 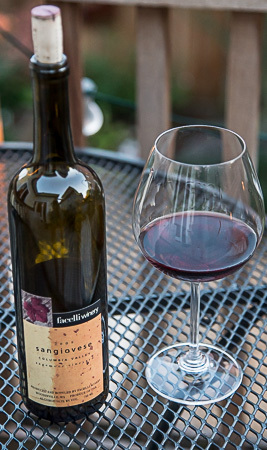 All that was needed was a bottle of wine to pair with our Gnocchi Margherita and Facelli Winery’s 2009 Sangiovese fit the bill. A bit of fruit, light tannins and enough acidity to stand up to our delicious cherry tomatoes. The perfect pasta wine! 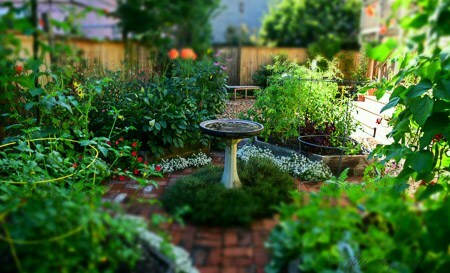 Our garden in August. And look what grew in it. My first Armenian cucumber, measuring 20 inches nose to tail! The first thing you should know about the Armenian cucumber is that it is not really a cucumber at all! It is a member of C. Pepo family along with muskmelons and honeydew. Also known as yard-long cucumbers, snake cucumbers, and snake melon, Armenian cucumbers are long, slender, not bitter, burpless, easy to digest, can be eaten with the skin still on, and…taste like a cucumber. 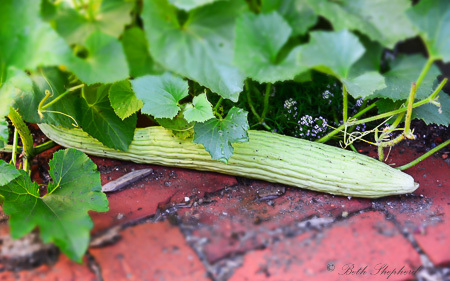 Although they can grow be be a couple feet long, they are best harvested when they reach 12 to 18 inches. I’ve also read the fruit will grow straighter if grown on a trellis than on the ground, where the fruit is often crooked. But obviously that wasn’t the case for our straight, lean and long cuke. What I should do with my cucumber was my next question. 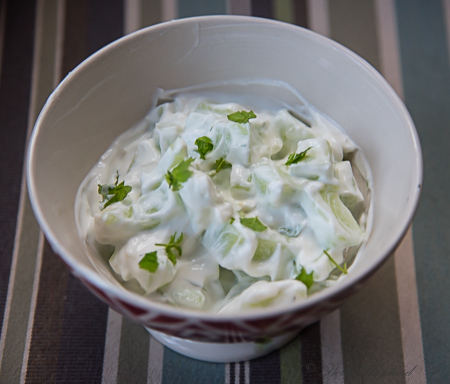 I entertained several ideas: cucumber salad, cucumber salsa and Jajik, a cucumber and yogurt dip. 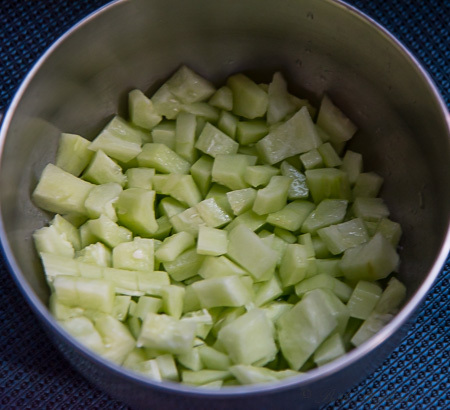 I decided on Jajik, though now that I noticed another whopper of a cuke growing in the garden, I might be able to try a different recipe very soon. 1 long, seedless cucumber, washed and peeled. You can use an English cucumber if you don’t have an Armenian cucumber. 2 teaspoons crushed mint. I prefer fresh but you can use dried (and I use spearmint, not peppermint). I have seen some recipes that also use cilantro or thyme. Cut the cucumber in quarters, lengthwise. Slice each section into thin pieces. Mine were not sliced thin but I will do this next time I make this dish. I have also seen some recipes where the cucumber is grated. Stir the cucumbers into the yogurt and mix in the garlic, salt and mint. Some recipes add water to the yogurt and the Jajik then becomes more of a soup. 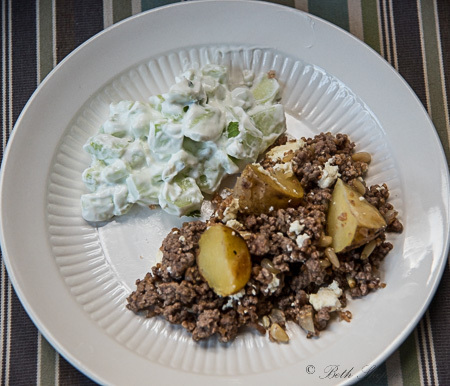 I wanted mine to be thicker because I was serving it alongside spiced ground lamb and potatoes. Hello summer! Earlier this week, we had a lovely dinner with a risotto recipe I invented. 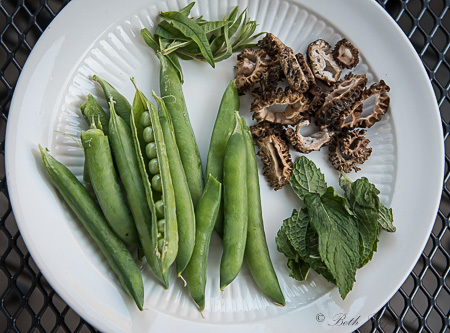 Our petit pois (French green peas) were ready for picking, morel mushrooms were at the market, lemon verbena and spearmint were happily growing in our herb beds and, well, there was that bottle of limoncello. Most of the time, when I make risotto, I finish with 1/4 cup of dry sherry, but for this recipe I decided to add limoncello as a complement to the Lemon Verbena from my garden. I will say straight up: I am generally not a sweet drink person but I love Limoncello, especially over ice with a spritz of my local fav, DRY Lavender Soda. 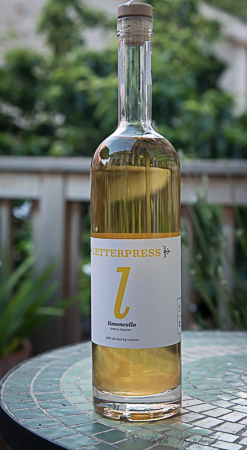 I have tried several Limoncellos over the years and Letterpress Limoncello is the bomb! Seriously, this is the best Limoncello I’ve ever tasted. Zingy lemon, not cloyingly sweet–Letterpress uses Washington Blackberry honey instead of simple syrup–no artificial colors. And…made in Seattle. Plus, I am a sucker for their label. I’ve always had a soft-spot for letterpress printing. Note: I notoriously cook without measuring, so the measurements here are approximate. I am of the if-you-like-more peas/mint/limoncello, use more peas/mint/limoncello school. Simmer broth in a sauce pan. 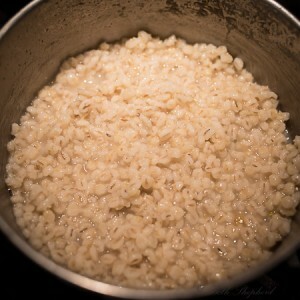 In a separate pan (Dutch oven or similar) heat oil over medium heat and add risotto. I personally like to cook mine over dry heat until it starts to brown and crackle a bit, but you don’t need to. Add 1/2 cup of the broth, stirring frequently, until all the broth is absorbed. Repeat, adding 1/2 cup of broth until the 4 cups are nearly gone and your risotto is creamy and soft (but with a bit of tooth to it). This will take about 20-30 minutes. Add peas, morel mushrooms and lemoncello and cook until the lemoncello is absorbed (another 5 minutes). Turn off the heat, add the mint, lemon verbena and 1/4 cup grated Parmigiano Reggiano), fresh lemon juice. Stir, cover and let the risotto sit for five minutes. Serve risotto in bowls (my personal preference) and top with shaved Parmesan. 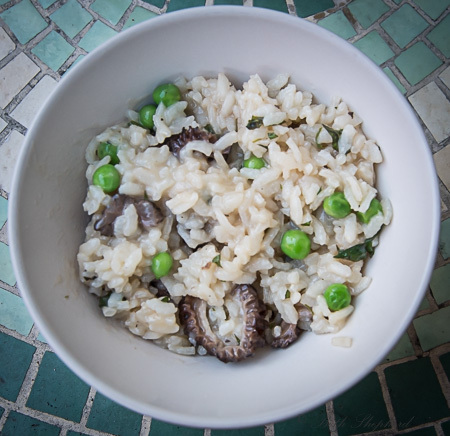 This risotto was one of those: Oh-my-god-this-is-so-amazing-I-simply-cannot-stop-eating it recipes. I made myself a limoncello and lavender soda cocktail to go along with our risotto, sat with my sweetheart on our deck looking out over our garden, enjoying a lovely Seattle summer evening. It doesn’t get much better! 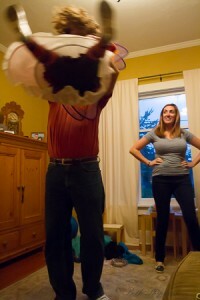 Our first Family Pie Day was a huge success. Big Papa, Little Bird and I got busy in the kitchen with our local cousins, and made Gluten free Apple Pie, from scratch, with apples from our trees! 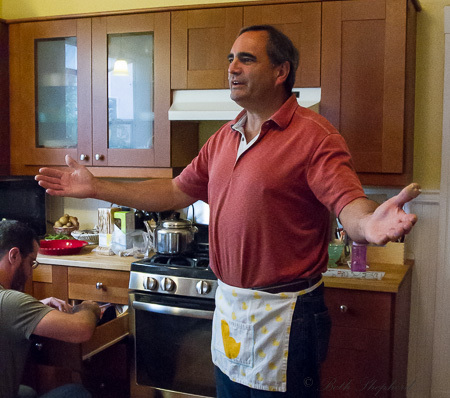 Big Papa and I had already prepared the gluten-free dough that we would use to make two 9″ crusts. Remember this dimension. It will become important later. We used Bob’s Red Mill ‘Gluten Free Pie Crust (Thanks, Bob!) and the real deal when it came to solid fats (I’m talking to you, butter, and you shortening). 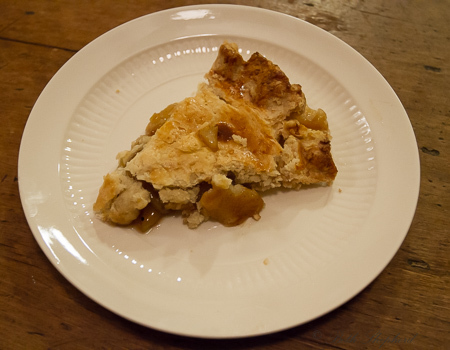 You can find the recipe we followed, right on the package of the pie crust mix, here. Now back to Family Pie Day. 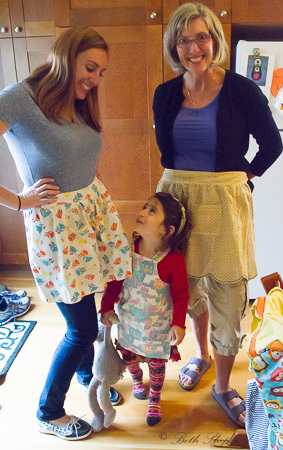 First came the donning of the aprons. Here are the girls! 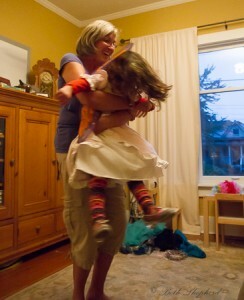 Little Bird’s apron was once her cousin’s. …their tape measure. More on this shortly. First we cut our apples, emphasis on ours. If you want to read more about growing espalier apples, check out my post, here. I couldn’t be prouder of our first big apple crop. 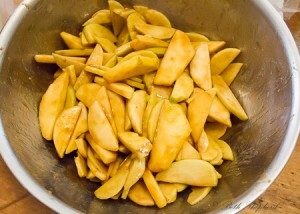 We used a variety of less-than-beauty-pageant-ready apples: some tart, others sweet; some crisp, others tender. 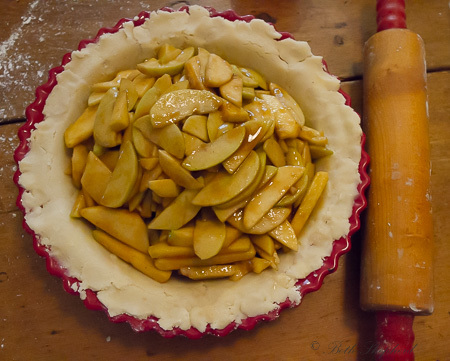 Peeled, cored and blemishes removed, they looked mighty fine for pie-making! 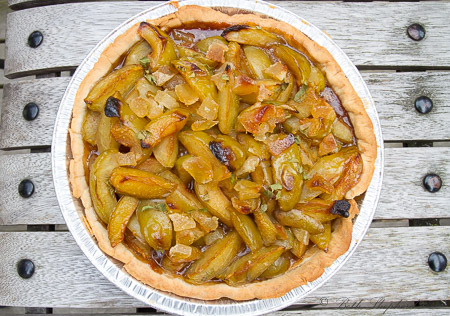 The recipe we chose called for an optional tablespoon of brandy, and Calvados (apple brandy from the French region of Lower Normandy), was recommended…if you have it. Which, in fact, we did. I’ve been waiting for the perfect moment to use the little bottle we got on one of our flights to France. Oh how we love you, Air France with your delicious airplane food (as airplane food goes), free champagne and brandy. We added a tablespoon (okay, maybe two) to our pie filling. I taste-tested the Calvados first to make sure our brandy was still “good.” It was very good. Next we needed to roll out the dough. This is the place in the apple pie making process where–depending on your point of view–having two engineers in the kitchen is either a blessing or a curse. And we measured. Both engineers were at the ready to measure, and remeasure, until we were sure–very sure–that our crust would meet the 12-inch recommended size, in order to fit into the 9-inch pie pan. I imagine the boys probably left some margin for error, and I’m also certain the margin was very small. Finally it was time to pour our pie filling into the crust, and top the pie off with the second crust. After brushing the crust with an egg wash and cutting a few slits in the top, our Family Pie was ready for baking in our (new!) oven. 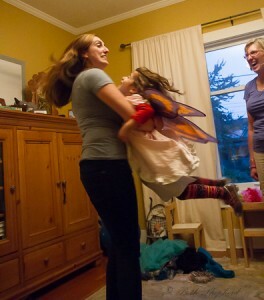 Then we retired to the living room to wait while the magic of pie baking transpired. 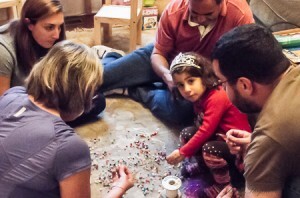 Let the bead making commence. This is what everyone does while waiting for pie to bake, right? At last, the buzzer let us know our Family Pie was ready to eat. The pie came out of the oven and what a lovely pie it was. So we all retired to the dining room, took a seat, a slice of pie, a scoop of ice cream and a glass of wine. This pie, our pie, was THE BEST PIE I’ve ever tasted. Maybe it was the homegrown apples? Or the made from scratch gluten free crust? 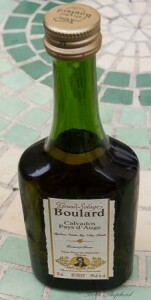 Or the Calvados, all the way from France? 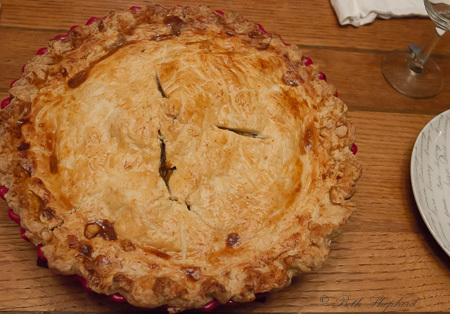 Or maybe it was simply because we all lent a hand–literally–to create our Family Pie. To family and to pie! 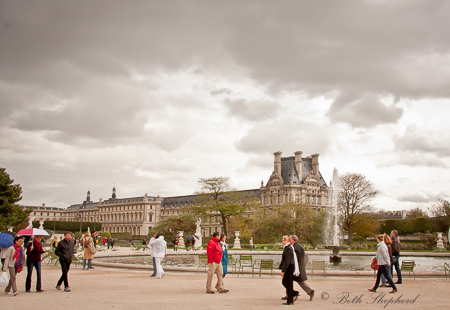 A blustery day in Paris, chilly even. Ominous clouds loom. People begin to put on their jackets and open parapluie to guard against the rain. Your mood feels a bit gray. Then you remember. You’re in PARIS, nestled under cover at a sidewalk cafe in the Tuileries. Autumn leaves dress the surroundings in rich hues of red and gold. You feel as though you are in La Musique aux Tuiliereis, Manet’s famous painting. 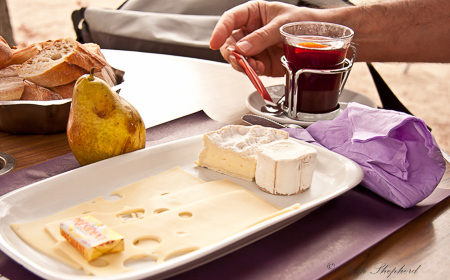 You’re dining on French cheese, a baguette and a fresh pear. And…you’re drinking Vin Chaud. mulled wine, the perfect accompagnement for a day just like this. 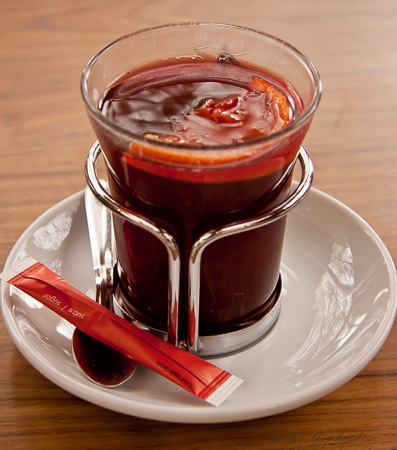 In fact, Vin Chaud almost makes you wish for a day like this. Mulled means to heat, sweeten, and flavor with spices for drinking, as ale or wine. Mulled wine is a global tradition with myriad recipe permutations. Glögg (Sweden), Glühwein (German), Vin Brulé (Italian), Negus (English), Navegado (Spanish), Forralt Bor (Hungarian), Wassail (also English)… and Vin Chaud (France). The common denominator is wine, red or white, sometimes fortified (adding a distilled spirit such as brandy), sometimes not, infused with spices and served warm. The process of mulling wine goes back centuries. Hippocras, a drink made from wine mixed with sugar and spices, usually including cinnamon, and possibly heated, was a spiced wine popular in the Roman Empire, as seen in the writings of Pliny the Elder and Apicius. After steeping the spices in the sweetened wine for a day, the spices are strained out through a conical cloth filter bag called a manicum hippocraticum or Hippocratic sleeve (originally devised by the 5th century BC Greek physician Hippocrates to filter water). Apparently, the recipe for hippocras was brought back to Europe from the Orient, following the crusades. The drink became extremely popular and was regarded as having various medicinal or even aphrodiasiac properties. You can use any fruity, though not overly sweet, red wine (or white if you’re not a red wine drinker) to make Vin Chaud. I suggest going light on the tannins. The wine doesn’t need to be expensive, just something you find drinkable. Your ideal mulling wine is an inexpensive burgundy, petite syrah, tempranillo, beaujolais, malbec or other “middle-of-the-road” red. If you’re going white, try an aromatic white wine like Riesling, Muscat (moscato) or Chenin Blanc. The recipe, below, also features a finishing splash of cognac. You could substitute any eau de vie, port or brandy, but Cognac seemed appropriate since I’m writing about a drink I enjoyed in Paris. Note: There are myriad combinations of spices for mulled wine. Some people like to add a cinnamon stick or two, and others prefer a pinch of freshly grated nutmeg. If you want less of a zing, you could omit the peppercorn. And, while I have access to fresh bay leaves, you could use dry or forgo. Use a nonreactive cooking pot or saucepan. Add spices and honey (or sugar) and simmer. Do not allow to boil. Turn off the stove and let the wine simmer 10-15 minutes. Reheat and, just before serving, add the cognac (or eau de vie). If you prefer your mulled wine with a tad less alcoholic punch, you can omit the cognac altogether, or add a tablespoon or two to the glass or mug and ladle the mulled wine over it. Strain wine into heat-proof serving glass or mug, removing spices (although you can leave the spices in, just don’t eat them). Garnish with a strip of orange zest. 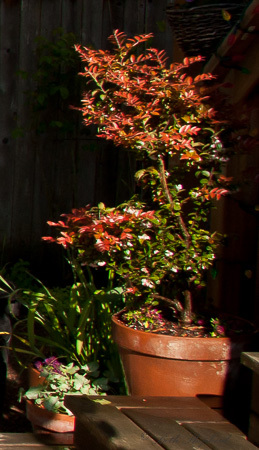 A few years ago, I had a huckleberry bush growing in a pot in our garden. A lovely plant: evergreen, copper-colored new growth, adorable bell-shaped flowers followed by delicious fruit. My huckleberry was doing very nicely, until, suddenly it wasn’t. When I saw fresh huckleberries at the farmers market in my neighborhood, I was elated. I should mention I bought the last pint the vendor had. The berry gods had smiled upon me! Huckleberries can be used to create so many delicious dishes. All things sweet like jam, pie, pancakes and muffins. And huckleberries also make the perfect foil for salmon–a bear’s dream. 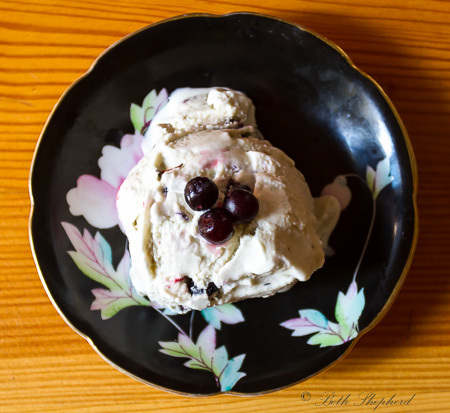 I decided to whip up a batch of Huckleberry Ice Cream with a lavender cream base. Oh my word. That ice cream was the bomb. What’s the best way to get your hands on fresh huckleberries? You can sometimes find huckleberries at your local farmers market, like I did, if you’re lucky. Or if you’re game for a hike, and live in Washington State, the Washington Trails Association (WTA) has a list of huckleberry hikes, which you can find here. Mid-August through September is the ideal time to pick. Do remember that huckleberries are also a favorite treat of black bears. And of course, you can also grow them. So guess what I’m going to buy tomorrow at the garden store? A huckleberry bush. 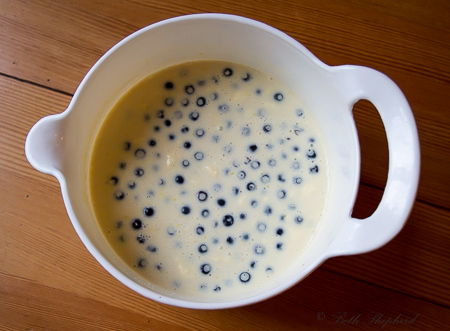 Heat the heavy cream, milk, and lavender buds in a medium saucepan, until it begins to bubble. Remove pan from heat, cover, and let the lavender steep for 30 minutes. 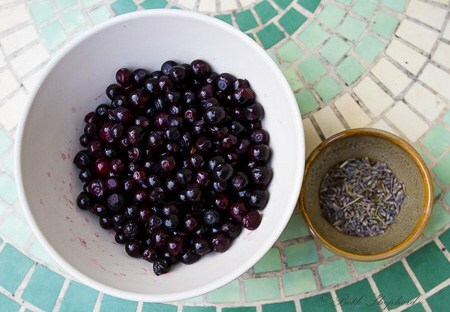 Pour the mixture through a strainer to remove the lavender. Return the milk to the saucepan and heat until it almost reaches a boil. In a separate bowl, whisk the egg yolks and sugar until they become thick and pale. Slowly add the hot milk to the eggs, whisking constantly. Return the mixture to the saucepan and cook over medium heat, continuously stirring until the mixture coats the back of the spoon (2-3 minutes). Remove from heat, pour the mixture through a strainer, and cool completely (either in the refrigerator in in a prepared ice bath). Stir in the vanilla, and fold in the huckleberries. Process in an ice-cream maker according to manufacturer’s instructions and store in freezer for up to one week. Last summer we took down five trees: two poplars that were far too big for our tiny yard, two Greengage plum trees and one apple tree. The fruit trees were horribly pruned and in a poor spot for fruit production, but I was still sad to see them go. The last tree left standing from our “old yard” is a Greengage Plum. As much as the suckers it sends every which way drive me crazy, I couldn’t part with that tree. Why? Because its fruit is plum spectacular. Every year, when they ripen, I make a few sweet treats with our plums. This year I decided to bake a rustic gluten-free pie. I gussied it up with lemon verbena from our herb garden and a candied ginger for pizazz. 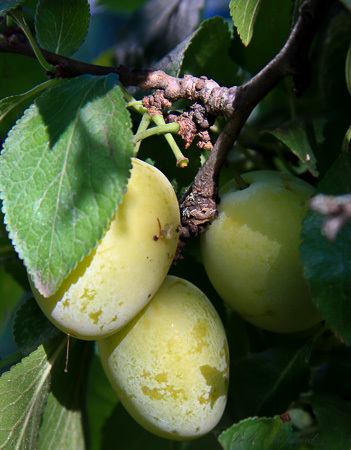 Read on for this great plum recipe as well as two others below. I bought my gluten-free crust pre-made because I have a three-year-old. You could do the same. But a homemade crust is the bomb. Note: Crusts with gluten-free flour will be more crumbly (homemade or purchased), which is why I didn’t fold over the edge of my crust. Make the crust: In a food processor, pulse flour, cornmeal, sugar to combine. Add butter and continue pulse until mixture resembles coarse meal, with a few pea-size pieces remaining. 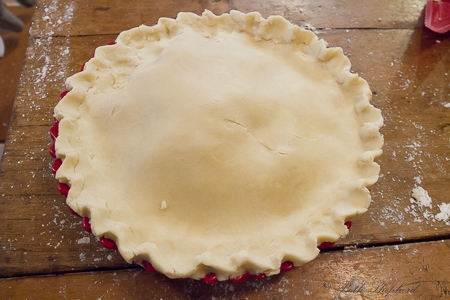 If you don’t have a food processor, you can mix pie crust with your hands, two forks or knives, or a pastry mixer. 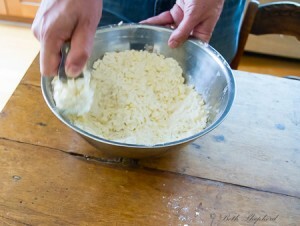 Add 2 tablespoons ice water; pulse until dough is crumbly but holds together when squeezed. (If needed, add up to 2 tablespoons more ice water, 1 tablespoon at a time.) Do not over-mix. Turn the dough out onto a floured work surface and knead it once or twice. 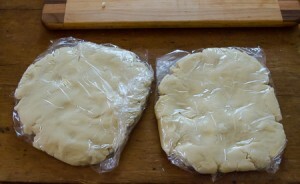 Then press the dough into a round, somewhat flat shape; Wrap in plastic and refrigerate at least 1 hour. Line a rimmed baking sheet with aluminum foil. Flour a large piece of parchment paper. Place dough on the paper. 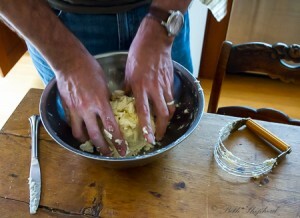 Roll out the dough, using your knuckles apply pressure to the edges so it won’t crack. Lightly flour the top of dough to prevent sticking. 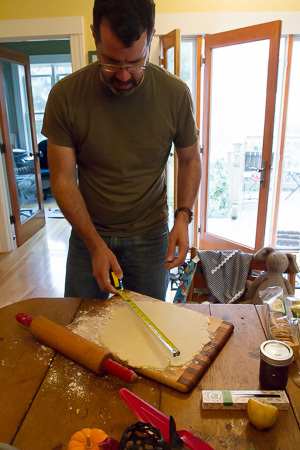 Roll out your dough (to about 14′ diameter). 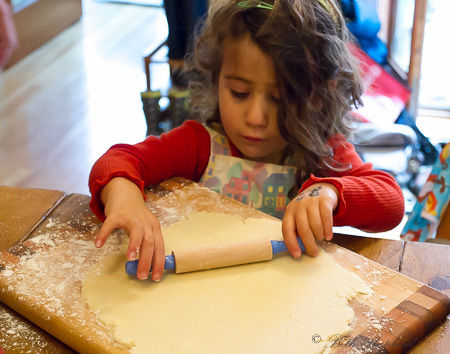 Transfer dough (leave it on the parchment) to a prepared baking sheet. 1 large egg yolk, mixed with 1 teaspoon water (I didn’t do this with a purchased crust, but would if I made my own). 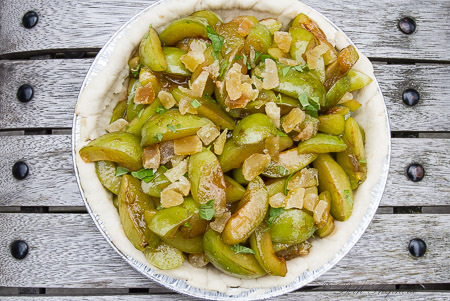 Make the filling: In a large bowl, toss together plums, sugar, and flour. Put the plum mixture in center of prepared crust, in a mound, and leave a 2-inch edge. Fold the edge over fruit. Brush dough with egg wash. Sprinkle lemon verbena and candied ginger on top of the plum filling. Bake: Preheat oven to 400 degrees. Bake tart until crust is brown and filling is bubbling, about 45 minutes. Transfer baking sheet to a rack and cool for 20 minutes. Slice and serve warm or at room temperature (with ice cream, in my opinion!). If you’re not into crusts, then Plum Crumble might be the recipe for you. My crumble topping uses oats, hazelnuts and candied ginger (yes, I love that stuff). 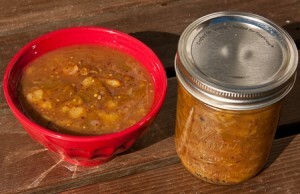 Or, if you’re looking for something sweet and savory to toss over fish or chicken, Plum Chutney is the way to go. I use star anise, mustard, cloves, cinnamon, Walla Walla sweet onions and ginger (fresh, not candied, for this recipe). 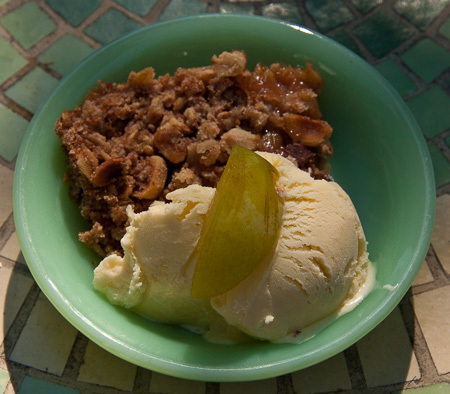 And if you want to make some delicious ice cream to go with your pie, here are three of my favorite recipes: Heavenly Honey Ice Cream, Bay Laurel Ice Cream, and Cinnamon-Clove Ice Cream.